Need to make some extra cash? Need to get rid of some of the extraneous things cluttering up your home and garage? Having a yard sale is a great way to answer both these needs. I am the local “Yard Sale Queen” among my friends and family and I have gone to hundreds of yard sales and hosted quite a few myself. I’ve discovered new neighborhoods, find awesome items for cheap and had quite a bit of fun. 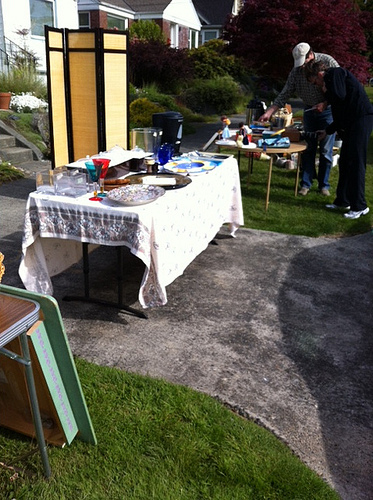 Here are some tips on how to have a successful yard sale. The more items for sale will draw more customers. Place balloons or a sandwich board sign at your yard entrance. 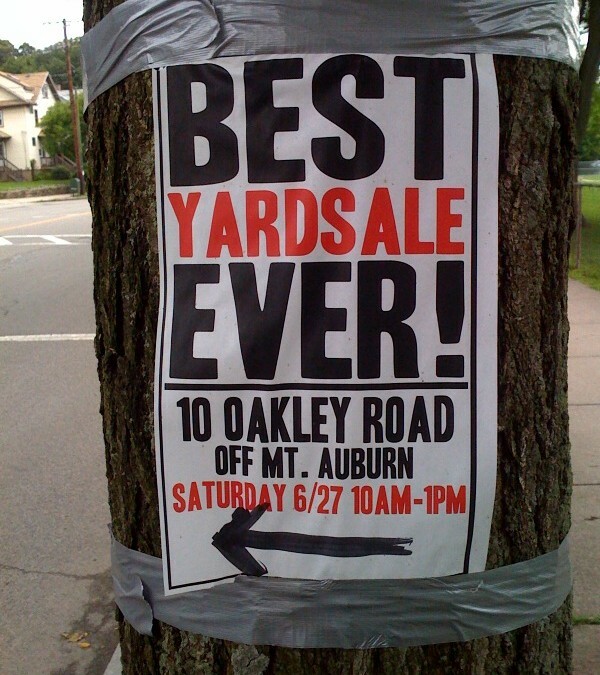 Please don’t forget to take the signs down after the sale!! Consider setting up a children’s section so kids can play and parents can shop. Clean all items (nothing is worse than picking up a dirty kitchen appliance). Have everything easily accessible-do not leave boxes right in front and below tables-this prevents buys from getting in close to the merchandise on top of the tables. Don’t leave lots of random items in boxes-yes, some people will rummage through these, but most won’t. Put batteries in things that require them. Don’t set up items so people trip over them; organize the items so there is a flow of traffic. Wear a fanny pack or an apron with pockets as a way to stash cash. It is wise to offer some Free items, but only to people who buy other items (free book or CD with a purchase). 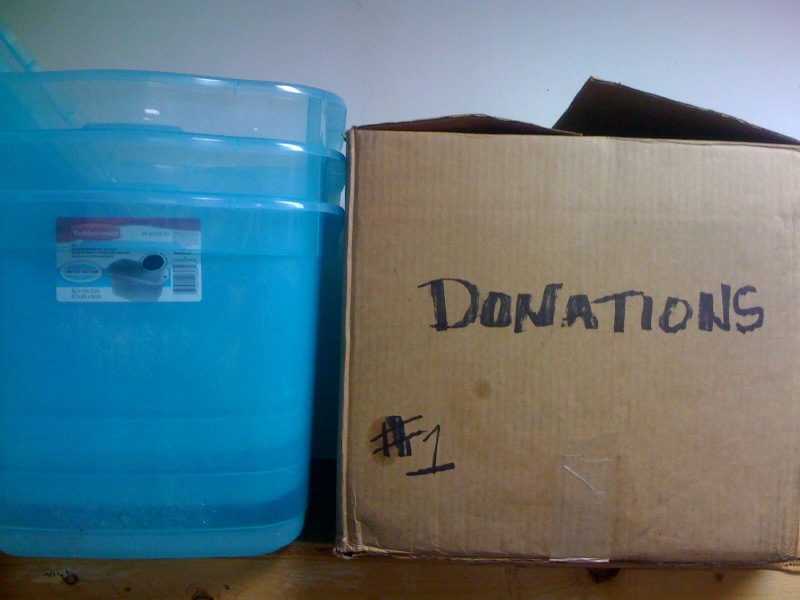 You should expect to get about 10 cents on the dollar for used items, e.g. a coffee maker that you bought for $50 and is in great shape should warrant a $5 sticker at most. But take $3 for it if offered. Have on hand plenty of boxes, shopping bags and old newspapers to help shoppers package their goods. Keep an eye on your house: don’t let strangers go unattended into your home or garage. 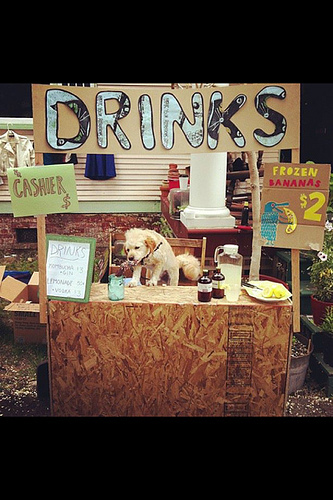 Consider having refreshments: Set up a cooler with small bottled water for free; sell some refreshments at minor costs. Get the kids involved. Set a relaxed tone where you are willing to interact with people and make them feel comfortable. If you have kids, train them not to “attack” potential buyers with all sorts of “helpful buying suggestions”-have them sell the lemonade and brownies and sharpen up their math skills with the cash transactions. Place some items out on the curb with a “FREE”” sign. Try to resist bringing stuff back into the house, unless of course they are of value and can be posted on Craigslist. Put some stuff in the trash and your recycling bin.